Strawberry Fare is a restaurant, open for breakfast, lunch and dinner, but for me it has always been the dessert place everyone goes to late at night. Reservations are high recommended, especially if you wanted a seat at the 'normal' meal hours. After the earthquakes, Strawberry Fare has moved to a new site near Hagley Park, and its faithful sweet taste bud fans have followed. K and K were passing through Christchurch and had only a few moments to catch up. Why not over some of our famous desserts? 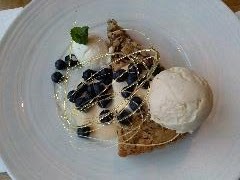 Caramel and hazelnut torte was wonderfully warm and soft, and its almost over sweetness was balanced by the cool vanilla ice cream and scattered blueberries. The presentation is top notch, and the experience is a true sweet affair.